When I saw the Zombie Cross-Stitch kit, I couldn't get over how cool it is. 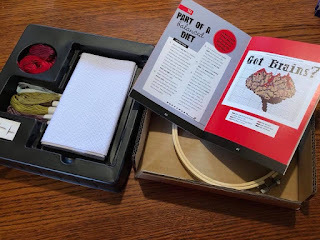 It includes everything you need to complete two projects (then you would just need to add additional fabric and thread to do the rest. - if your like me I have tons of both on hand!) I think it would be neat to tea-dye the fabric and make them look aged then hang the completed work for Halloween decor! Everything you need to stitch your brains out! Every undead heart will be warmed by these gruesome and hilarious cross-stitch projects. Zombie Cross-stitch (August 2018; ISBN: 978-1684124121; $19.99) includes a 64-page book with an overview of basic techniques and instructions for creating a dozen cross-stitch patterns, plus all the materials needed to complete two projects. 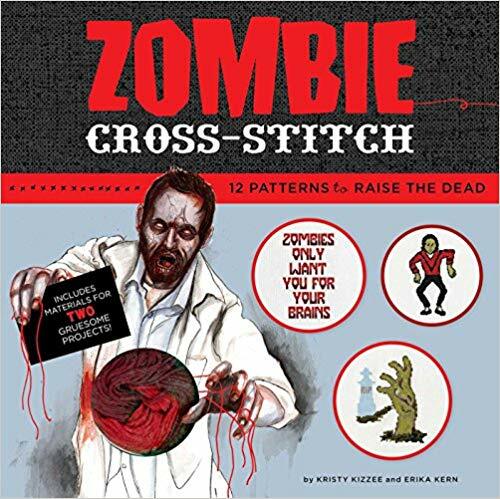 From baby bibs and pillow covers to office signs and door hangers, this light-hearted kit will inspire crafters to bring their favorite zombies into the land of the living. 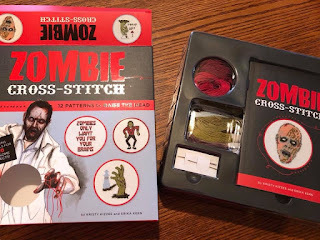 One lucky reader will win a Zombie Cross-Stitch Kit!